After performing an initial Factory Grade® assessment at a renewable energy plant, a cable was found to have near end termination discharge at operating voltage. The on-site crew attempted to mitigate the Partial Discharge (PD) activity by disassembling the termination; they visually inspected the cutback and verified dimensions, then sanded and cleaned the insulation. Upon reinstalling the T-Body and retesting the system, no improvement was found in the PD measurements. The crew tested the cable system a third time after installing a new T-Body and a fourth time after replacing the cable adapter. Both procedures did not mitigate the substandard PD activity. Cutting off the lug and re-terminating also proved to be ineffective. At this point the crew decided to cut off 2 feet of the cable and re-terminate. During this procedure broken concentric wires were observed where the jacket had been removed. A closer inspection revealed semi-con damage at the same location. In this case the jacket, the concentric wires, the outer semi-con and the insulation all exhibited significant damage. The stress enhancement of the embedded semicon and the void in the insulation were determined to be the cause of the substandard PD activity. 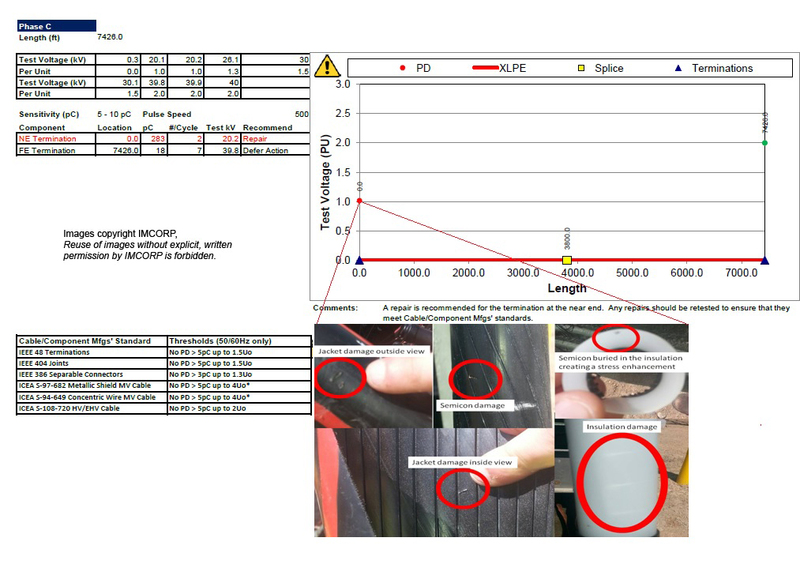 The importance of measuring this cable system to the manufacturers’ specifications proved invaluable here since this cable had already passed a very low frequency (VLF) PD test on a previous date. Using an offline 50/60Hz PD assessment, with better than 5pC sensitivity, provided identification of all of the components within the cable system and provided a full assessment of the condition of each; including terminations, joints and the cable.